YANGON – A local developer led by influential businessman U Kyauk Taung is proceeding with a major construction project in southern Rakhine State in defiance of an order by the Union government to halt the work. Htarwara Aung Myay, a public company, is developing a new town on hundred acres of land in Taungup Township. 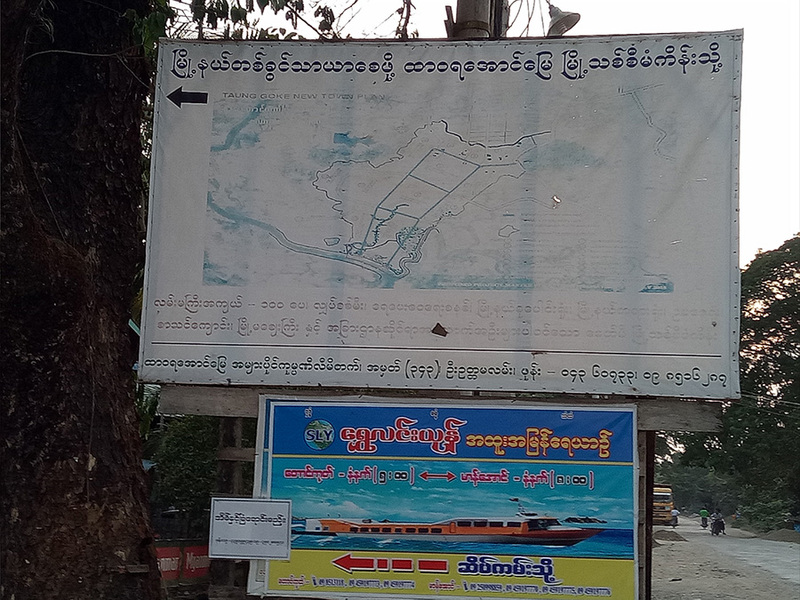 Nay La Thit Sar, a construction company owned by U Kyauk Tuang, is participating in the urban development project on the basis of permission granted by the previous Rakhine State chief minister, U Hla Maung Tin. The Union Solidarity and Development Party (USDP) member held the office during the administration of former Myanmar President U Thein Sein. U Kyauk Taung established Htarwara Aung Myay along with about 52 prominent local people, including many township leaders. The company has acquired hundreds of acres of land located on the town’s outskirts. The 450 acres include mangrove forest, farmland, unused land and pasture, according to U Kyauk Taung. The developer intends to build housing, a park, a football stadium, a market and and a wedding complex on the site. It has invested about 2 billion kyats and completed about 30 percent of the construction work, including roads, bridges, a water-supply system and a connection to the national power grid. U Kyauk Taung has estimated the entire project will require investment of about 10 billion kyats. He admitted to The Irrawaddy that his company was ordered to stop construction by the Union government. However, The Irrawaddy has independently verified that construction continued at the site in Taungup Township in early May. Although the company has yet to be granted Union government approval to use the land, company posters advertising the project could be seen at several road junctions in the town. In March, National League for Democracy (NLD) Lower House lawmaker Daw Ni Ni May Myint asked the chamber whether it was normal for a public company to launch a project as large in scope as a new town without approval. Such projects usually require authorization by the Union government, she said. Dr. Aung Thu, the Union minister for agriculture, livestock and irrigation, replied that public companies are not allowed to launch such projects without government approval. On May 3, the company requested permission from township authorities, including the municipal committee and some lawmakers, to hold a coordination meeting in the town. The company’s project director and shareholders said at the meeting that they had selected about 310 acres on which to build the new town. The information on the size of the project contradicted a previous statement by the chairman, however. Both the NLD lawmaker and the head of the municipal committee, U San Nge, told The Irrawaddy that Htarwara Aung Myay company bought from the farmers about 179 acres of farmland. According to company documents, it bought 123 acres of vacant land, and 6 acres of mangrove forest. The farmers were paid just 2.5 million kyats per acre of land. U Kyauk Taung declined to clarify the dimensions of the purchased land during a phone interview on Monday. He said the farmers agreed to allow free use of the pasture land, which is referred to as “wasteland” in company documents. 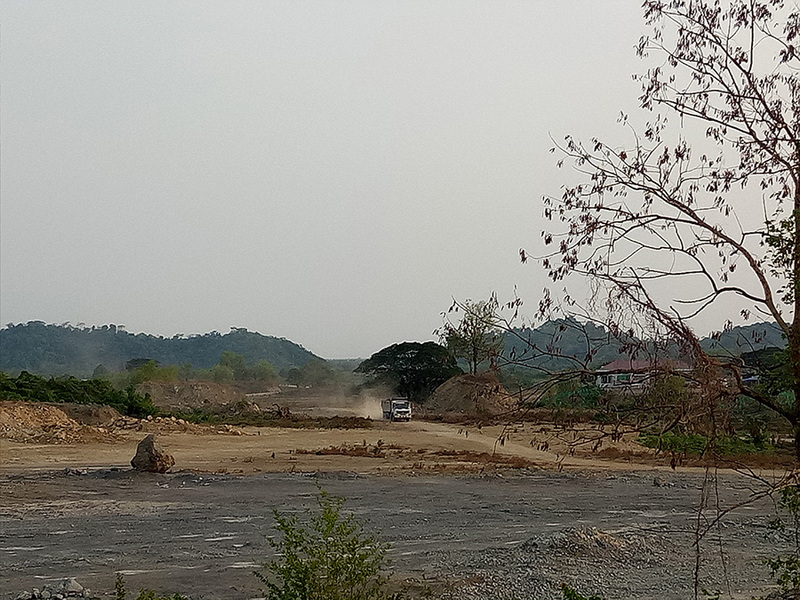 The Irrawaddy independently verified that some hills on this land had been flattened to make way for the development. U San Ngwe said U Kyauk Taung has close ties with the USDP and actively supported it during the campaign for the 2015 general election. Expecting a USDP victory in Taungup, the company brought in heavy machinery and began constructing roads, filling in land and building structures without waiting for Union government approval. The USDP ultimately lost the constituency to an NLD candidate in the election, and the NLD-led government ordered a review of the project. “The new government found that the project was in breach of legal requirements and ordered that it be halted,” U San Ngwe said. According to him, township authorities and the government’s land scrutinization body discovered that Htarwara Aung Myay had grabbed the approximately 130 acres of pasture land without compensating the farmers. He said that in a previous purchase of about 264 acres in Taungup for a university project under the previous USDP-led government, he bought a large amount of hilly land for a pittance. He had followed a similar process in purchasing land for the new town, he said. “That land is not fit for cultivation. I have been buying land here [in Taungup] for all government departments whenever they ask. When any government asks me to build something, I make it happen,” U Kyauk Taung said. The municipal committee confirmed that some 130 acres of the project’s land was pasture land confiscated by the company as “wasteland and vacant land”. U San Ngwe said that, generally, farmers in Rakhine do not apply for separate ownership documents for such land from the government, as it was recognized as customary land by the community. Moreover, the company was only approved to fill mangrove forest land; other lands are still awaiting La Na (39) forms. These are official land-use permits approving use for other purposes. In addition, the committee had found that the actual amount of land being used by the developer did not match the company’s initial proposal. It has recommended that the site’s dimensions be reassessed. Moreover, the company has already built brick housing units on Taungup’s outskirts on land for which it does not have land permits. It plans to sell 40 x 60 square-foot homes for 15 million kyats. Some residents of Wae Gyi village told The Irrawaddy that real estate prices have climbed dramatically in recent years as the developer has put out word of the planned new town. U Kyauk Taung said the housing development was a a “simple” project, adding that no units had yet been sold. Despite more than 100 acres of land being taken from their owners without compensation, neither the township’s land securitization committee nor land rights activists have received any official complaints from the farmers. 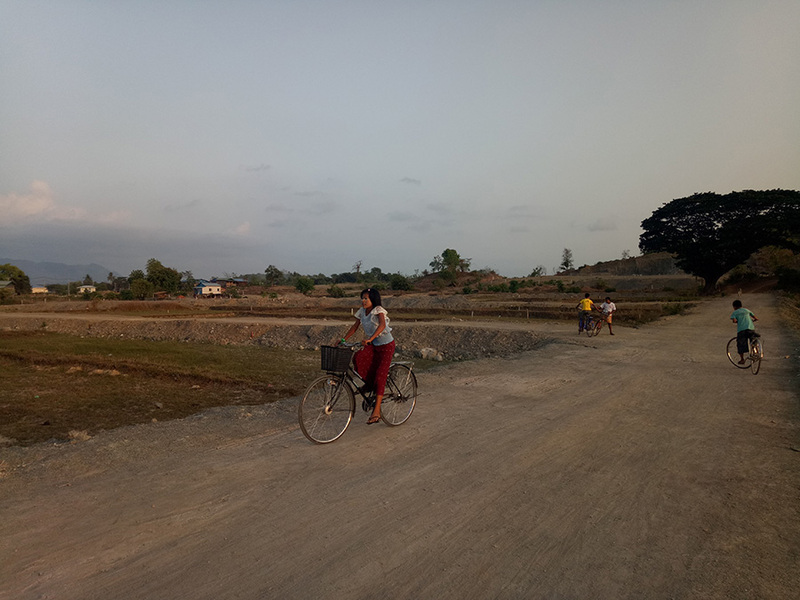 One activist told The Irrawaddy that almost every wealthy resident and community leader in Taungup Township was involved, directly or indirectly, in the new town project. Therefore, poor farmers dare not oppose U Kyauk Taung, who is also a vice chairman of Myanmar Kyaukphyu Special Economic Holding Public Company Ltd (MKSH). U Kyauk Taung acknowledged that his project was under investigation by the Bureau of Special Investigation after questions were raised in the Lower House. He complained that his company had donated about 15 acres of land to house a new 100-bed hospital in the new town. He said buildings had already been built on the site, and added that 7 acres of land had been sold on to the Housing Department at their original price during the former government’s term. He failed to mention that his company won a bid to build the hospital on the site. Municipal committee chair U San Ngwe said the body had already submitted its findings on the project to the Rakhine State cabinet. Legally, the company needs a recommendation from the township municipal committee before submitting its proposal to the state government, with final approval then required by the Union government. Newly appointed State Municipal Affairs Minister U Win Myint confirmed that the state Cabinet had received the Taungup municipal committee’s report, and said it would be discussed at a Cabinet meeting in the coming weeks. “If they neglect to follow the procedures, the project is likely to be rejected,” U Win Myint said.